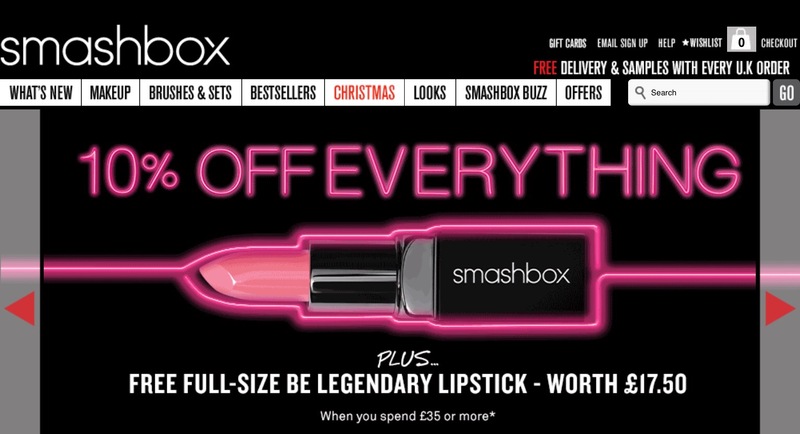 Wanted to let you know that Smashbox currently have 10% off everything / any order online and a free Full Size Be legendary Lipstick (worth £17.50) when you spend £35 or more until 11.59 tonight 27.11.16 or while stocks last. Free gift will automatically be added to checkout. Lovely treat for yourself or to give as a gift. Great selection of products and sets to choose from as well. Please see *insert / photo below and link here for full details. Also remember to sign up to Topcashback.co.uk (if you are not already signed up), no catches, (just means you can get cashback on your purchases with a number of retailers and currently you will get 10.4% cashback on Smashbox purchases – you just need to go through Topcashback.co.uk to the Smashbox site and then shop as normal) – if you sign up through my link here you will also get a free £5 Amazon Gift Card. I hope you found this helpful – however from next week I also intend to do a separate page for free gift(s) with purchase offers. I will regularly update this page with offers and will do a separate post for any special offers.